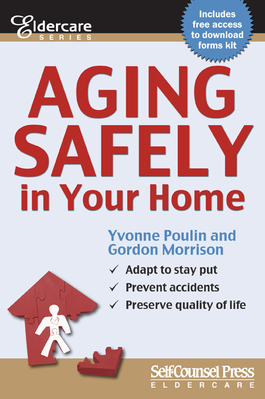 Aging Safely in Your Home published by Self Counsel Press is a book inspired by the thousands of seniors worldwide who want to maintain their independence as they age. Time takes an inevitable toll on the aging mind and body but there are many things that can be done to offset the changes that will occur. This book is a combined perspective of a health practitioner (Yvonne Poulin) and a building technologist (Gordon Morrison). Yvonne guides the reader through four chapters of personal adaptations that can be helpful to maintain independence while Gordon guides the reader through five chapters of home adaptations that can be helpful for maintaining autonomy in one's own home.